Fairy tales collide in a modern musical twist on Happily Ever After at Norwood High School’s Paul M. Alberta Performing Arts Center at Norwood High School on Sept 17, 18, 19 at 7pm and Sept 20 at 2pm. 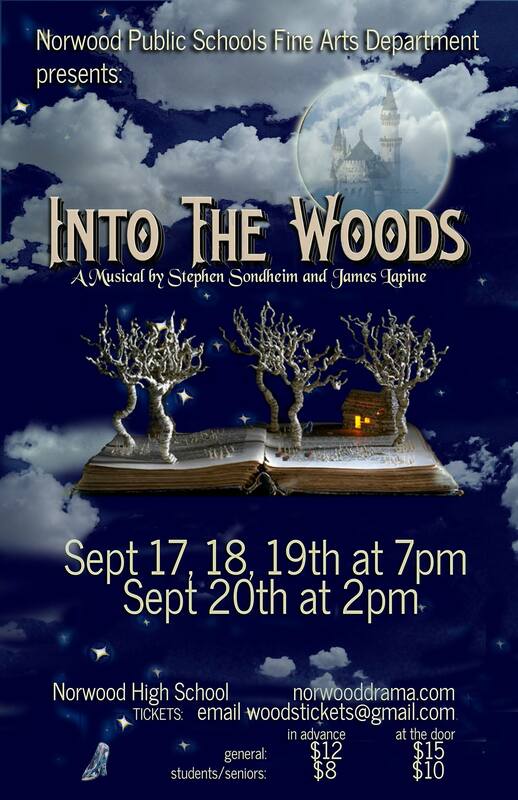 See our cast bios and more in the Into The Woods Playbill program online! The Backstage Boosters will be offering tickets in advance at a discount, as well as selling at the door. Hi, I am spending the evening with my two granddaughters, age 10 and 7, Saturday and just noticed the flyer up at the high school. Can you tell me if the play is appropriate for a 7 year old and what is the charge for the tickets? Thanks. Yes, based on a collection of Grimm’s fairy tales, it is suitable for children. Characters do die, but not onstage. Email woodstickets@gmail.com for advance rates ($12 general admission, $8 seniors/students) or buy tickets at the door ($15 general admission , $10 seniors/students).